Autumn is coming on strong with cooler nights and shorter days. The plants are taking notice and are beginning to shed some of their dry leaves, or turn pretty shades of red and gold. But a few have surprised me with a flush of new blooms and foliage. Hydrangea macrophylla 'Bailmer', a pretty big leafed hydrangea sits quietly in a back corner of my front garden. I'm thinking of adding some aluminum sulfate to bring the blooms back to a blue color next year. Cherokee sunset rudbeckia has put on a fantastic show this year. It has weathered the hot summer and doubled in size with modest watering. I've been very pleased to pull into my driveway after a long day of work and have this pretty plant greet me with such cheer. I haven't spent much time talking about Scutellaria suffrutescens 'Cherry Skullcap' but it blooms all summer to frost. It's a sweet, low growing plant that I have placed at the edge of my beds. 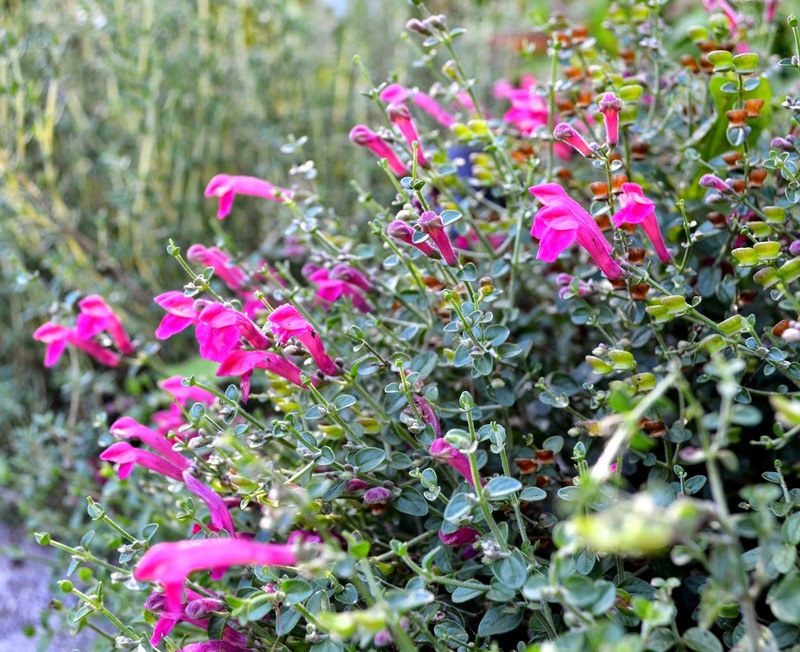 The bee's love it and it is very drought tolerant. Much to my surprise, petite English Daisy's are providing a fall flush of color. 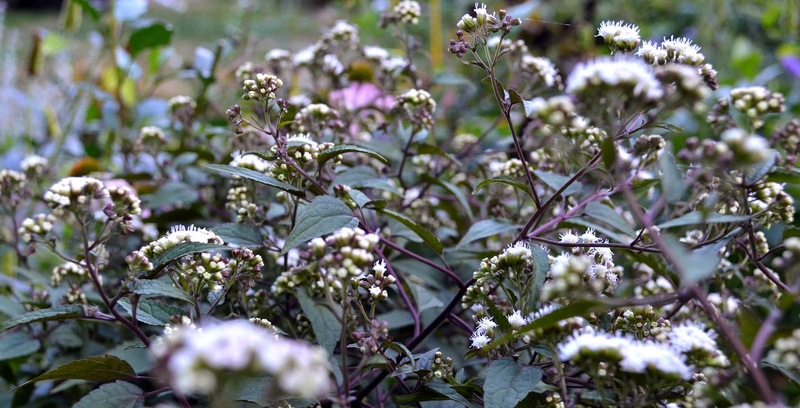 Eupatorium rugosum 'Chocolate Joe Pye' is blooming! This is my first year growing this plant and I'm delighted with the late season blooms. The bee's are too. I wasn't sure about this plant. I was afraid that it was a bit more needy than my back gardens allow for as it tends to 'wilt' midday in the head. But, the end of the season blooms are a perfect reward for my persistence at helping this plant establish. 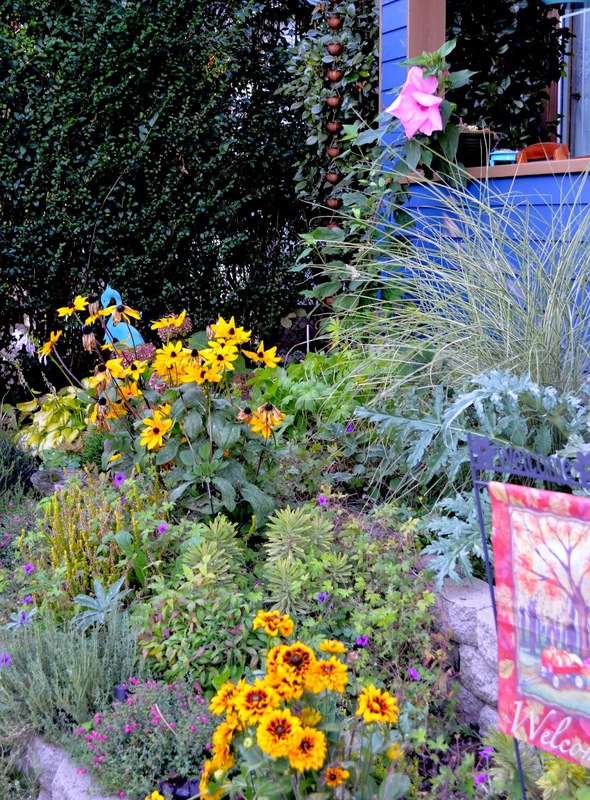 Here's a peek at my late September, front yard garden. 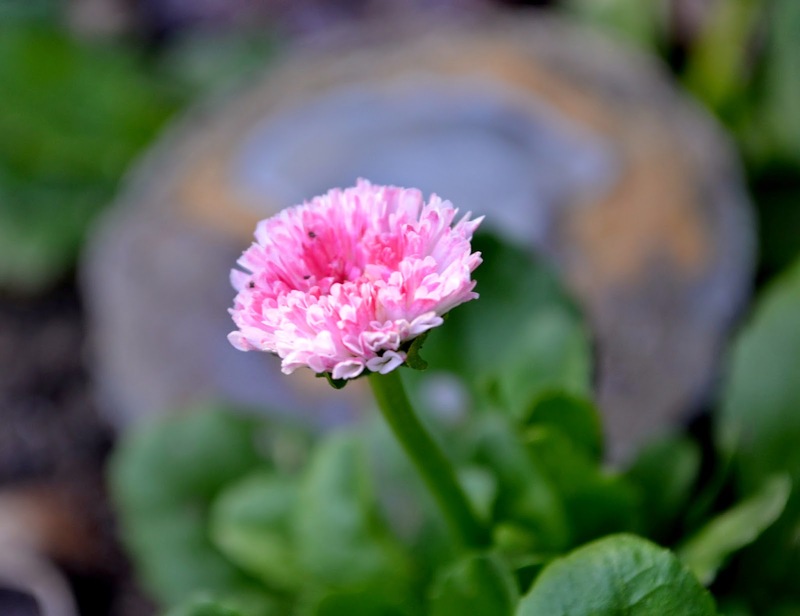 Any surprise blooms in your garden? 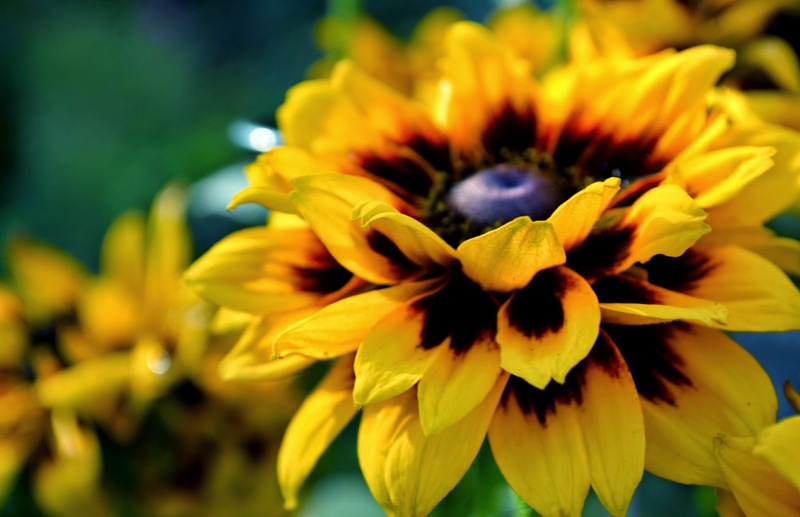 I just bought a Cherokee Sunset Rudbeckia a couple of weeks ago, you might have seen it in my pot ghetto. It looks like a great plant. I like your cherry skullcap, such a pretty flower. There's little colour left in my garden now - it's mainly just the grey-green of Leeks and Winter brassicas! Time to plant garlic Mark! Ut's great to have colour now isn't it? If I am diligent about cutting off the spent blooms of Knphofia, they keep right on blooming. Then of course there are the dahlias chugging along until frost. Your garden is singing a beautiful swan song. I honestly don't know why that Scutterella isn't in every garden. It's the sweetest plant. I love mine and wish I had more but it isn't easy to find. I love your front border. 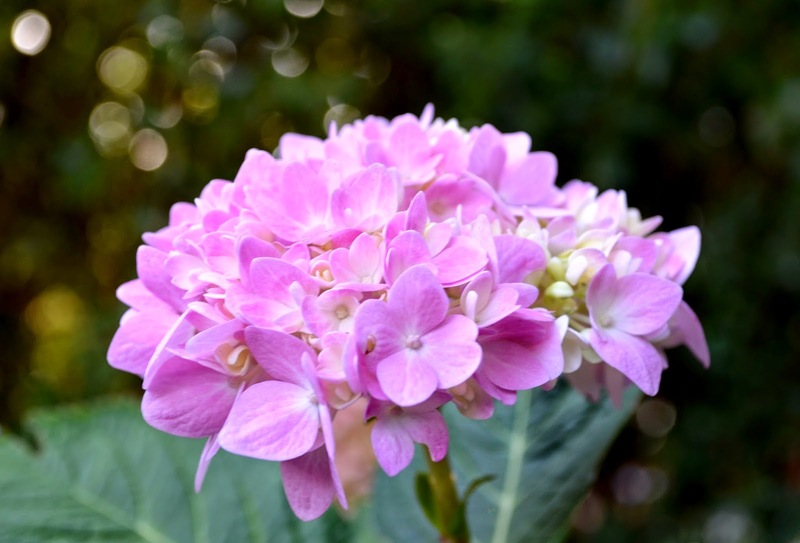 It's so pretty but I have to say, I disagree about changing that sweet hydrangea back to blue. The pink is perfect. Would you expect a different reaction from me? Ha, ha. :) I hope you have a great weekend. You've got more color in your garden than I, my Rudbeckia is winding down and even the asters are past their peak. Your garden looks good, still plenty of life in it.